Too much nitrogen triggers rampant growth of algae that can kill fish, harm wildlife, poison shellfish people eat and undermine quality of life. Reducing our fertilizer use is an easy path toward cleaner, safer water. 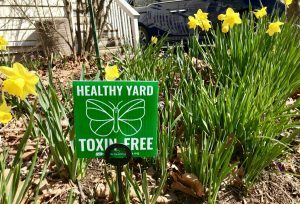 A lawn without pesticides, herbicides or synthetic fertilizers is safer for our children, pets, wildlife, and our waterways. #1 Keep grass clippings on your lawn: Grass clippings rapidly decompose, keeping moisture and nutrients on your lawn. Turf scientists have found that after a few years of leaving clippings on the lawn, fertilizer needs are dramatically cut or eliminated. #2 Apply no (or less) fertilizer: Eliminate lawn fertilizer use, or reduce your application to once or twice per year. Try using one-third to a half of the amount of fertilizer recommended on the bag. #3 Apply it at the right time: If you use fertilizer, turf scientists recommend applying once around Labor Day. If you apply in the spring, do it around Mother’s Day. When you apply, use fertilizer sparingly. Organic, slow-release fertilizers are better for your lawn and the environment. There is no benefit to applying fertilizer in cold non-growing months. Applying it in hot months can damage your lawn. #4 Don’t fertilize your lawn before a rainstorm: Excess fertilizer washes off into the stormwater system, which leads directly to local streams and/or the coast. Can you make a bigger commitment? Reduce your lawn’s size. Replace grass and plants that require fertilizer and pesticides with native plants, ground covers or landscaping that don’t. Do not apply ANY fertilizer or pesticide to turf that borders a waterbody. The harmful chemicals in those products will end up in the water. If your property borders a lake/pond or river, leave a buffer of unfertilized grasses or other vegetation of at least 20 feet. Keep your lawn tall (2-4 inches). Taller grass allows for a deeper root system to develop and retains moisture in the soil, helping you conserve water.